El Vedat is a development located on the small mountain of the same name, in the municipality of Torrente 9 kilometres from Valencia city centre. The prestigious residential area sits 142 metres above sea level on the edge of the Sierra Perenxisa, whereas the town centre of Torrente can be found at the bottom. The name Vedat refers to the fact that the area was a private territory (vedado) belonging to some monks in the Middle Ages. El Vedat combines living in a tranquil natural area with close proximity to amenities and leisure activities. Situated adjacent to Torrente centre, the mountain is rich in vegetation and Aleppo pines. The road to the town centre features the Las Américas shopping centre which contains a supermarket, shops and restaurants. Torrente is the third largest town in the province with 80,000 inhabitants, therefore all amenities can be found close by. 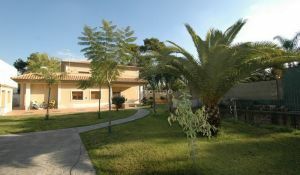 El Vedat enjoys excellent transport links, such as the CV-36 motorway which allows quick and easy access to Valencia. The A-7 motorway, which runs the length of the east coast of Spain, provides access to the rest of the country. The international airport is located 12 kilometres to the north of El Vedat in Manises and offers daily international and national flights. The metro is another fantastic mode of transport, especially useful when travelling to the city so as to avoid traffic and parking problems. Torrent Avinguda and Col·legi el Vedat are the metro stops which are the closest stops to the development, however there are two further stations (Torrent and Realón) in this particular municipality. Various buses also serve the area, connecting with Valencia, Torrente and other towns. One of the most attractive things about El Vedat is the quantity and quality of restaurants populating the hill. The eateries offer the best in Valencian gastronomy, generally specialising in rices. The restaurants, which are also used to host family celebrations such as weddings and communions, harmoniously combine quality food, easy access and natural surroundings. The area is also renowned for its well established schools that tend to have better facilities than those in the city. Among the various institutions, the most prestigious are the bilingual Julio Verne school, Santa Teresa and the Colegio El Vedat. From here, golf fans have access to many golf courses such as 9 hole Masía de las Estrellas in Catarroja (9 kilometres), 9 hole Manises (13 kilometres), El Bosque in Chiva (14 kilometres), Foressos in Picassent (16 kilometres), El Escorpión golf club in Bétera (21 kilometres) and El Saler (25 kilometres). Living in Valencia, the sea is always close by. The city beaches and those to the south are the closest ones to El Vedat, namely Malvarrosa, Las Arenas, Pinedo, El Saler and El Perellonet. The closest marina is the Port America’s Cup in Valencia city 16 kilometres away. Other ports close by include Port Saplaya at 19 kilometres, Pobla de Farnals at 27 kilometres and the El Perelló yacht club at 30 kilometres. Browse El Vedat property for sale listings.